It's turning out to be quite the week for The Last of Us 2. 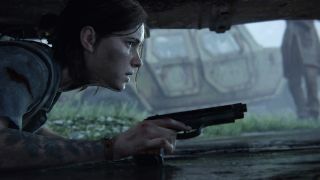 Not only did the PlayStation Store seemingly imply that Naughty Dog's third-person action adventure would be arriving sometime this year, but a developer diary from the studio earlier last month turns out it's been hiding some new revelations about the game in question. As spotted by the Last of Us' eagle-eyed fanbase on Reddit, Naughty Dog's International Women's Day video from March 8 features glimpses of various employees working on the sequel, and the blink-and-you'll-miss-it images seen on their desktops gives us our best look at the game since E3 2018. At 0:50, for example, you can spot what appears to be Joel moving around as the playable character on the screen in the background, but it's the 0:38 mark which proves the most provident in unofficially revealing more about The Last of Us 2 before its next big PR push. Have a look for yourself before we get into it. Now, pause, zoom, and enhance. The screenshot behind Naughty Dog UI designer María Capel's face is almost definitely one a workbench, The Last of Us' stationary recuperation hubs where you could upgrade and modify your arsenal of weapons. You can even see the word "Upgrade" on the top left of the screen, and the highlight is over a revolver pistol. While this isn't exactly a bombshell of a revelation for those familiar with The Last of Us' gameplay, the fact that workbenches are seemingly returning with a much better looking user interface will be a small comfort to core fans. This is, of course, all a work in progress, and The Last of Us 2's finished Workbench UI could look completely different to what we're seeing here, or may be eventually scrapped altogether. There's also a chance that we're looking at a screenshot from The Last of Us 2's yet to be announced multiplayer mode, though the mug in the background again suggests we're looking at an in-game workbench. Yes, maybe I am overthinking it, but until Naughty Dog decides to reveal more about its follow up to a last-gen masterpiece, it's all we've got. The Last of Us 2 is already one of our most anticipated new games of 2019. Find out which others are on the way, or watch the video below for a bitesize highlight.